I sure do love a good melon, honeydew in particular (my stomach doesn’t cooperate with cantaloupe). 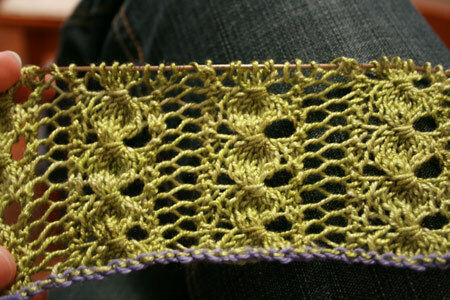 I also love my new melon-y project: the Melon scarf from Victorian Lace Today . The pattern is proving to be exceptionally easy. The pattern’s dinky little schematic masquerading as a chart? Long discarded and forgotten. The only mistake I seem to make on a regular basis is slipping the edge stitches incorrectly, and that’s something even I can live with. Many asked my opinion of Hand Maiden Sea Silk. So far I’m very pleased. The yarn is very soft and the knitted fabric is supremely drapey. In contrast to many other silks and silk blends I’ve used, Sea Silk is 3-ply, spun together very tightly. I don’t think I could make it split even if I wanted to! The consistency is similar to Lorna’s Laces Shepherd Sock, I’d say, though LLSSock is a wool blend and thinner. As a result of its silk content and tight twist, I’m not sure how well it will block – I expect some resistance to being blocked severely. Good thing the chosen pattern is already visible, without any blocking. Looking good! And you’re right, nothing does beat that Bryspun tip! Looks great! But you didn’t mention the most striking thing about Sea silk (which I figure you of all people would mention)the smell! It has an almost seaweedy smell. I disappated while knitting but came back after wetting and blocking. When I wear my shawlette, I continue to sniff. So far it’s looking beautiful. I’m glad you mentioned the stickiness of the yarn…I have some of that gorgeous Sea Silk myself and it’ll help to know that. I was thinking…maybe Knit Picks needles would be better for the sharp tips? I also don’t have a swift…so I’ll be extra careful winding it on my nostepinne. By the way, I have a knitting podcast…if you’re interested in listening….Sleepy Eyes Knits . Happy Knitting! Blunti Stumpos! Ha ha ha! It really looks gorgeous so far…I love that color. What a pretty and unusual pattern! LOL at Blunti Stumpos! I personally love them, but then again, I’m new to lace knitting (and have already discovered how terrible they are for such a job) After so many props for the KnitPicks needle set, they are now on my must have list. I had only worried about the cord (I can deal with nothing less flexible than the addi cord) and people tend to say the KP cords are as flexible if not better. Silk blocks nicely if you actually iron it. Pin it out and then a silk-level iron on top of it. Looks great! I used Addi with the seasilk, and still notice how it “sticks”. I recently finished a Sea Silk scarf – wet blocking + aggressive pinning worked out wonderfully. I wish that my LYS carried solids of the Handmaiden yarns, I do like that green color that you’re working with. that’s a beautiful stitch. cable-y, and yet not. maybe i’ll have to get that book after all. I started a Swallowtail Shawl in Seasilk on bamboo needles, probably clovers because that’s what I had in the right size. Once I reached the nupps, a friend commented it was like watching me get old and lose my ability to knit. Absolutely miserable! I switched over to some borrowed needles – the old nylon kind – and they were a little sticky but with much better points than the Clovers. I am now knitting a Flower Basket Shawl with Seasilk (the joy of Christmas – I get to knit with lovely yarn and my grandmothers get nice gifts). This time I am using, I think, a Susan Bates circular and it is much better. The metal is stiffer, but the smooth needles and nice points definitely help! I have that swift and it’s very nice. Pre-swift, I was dealing with major knots and was very close to throwing the yarn in the garbage at one point. I can’t remember what yarn it was, I just remember the frustration. It’s a great investment (and just plain fun to use!). Our mutual friend Calamintha first suggested these to me, and I’ve been thoroughly pleased with it. Can’tabide the cantaloupe? 😉 Beautiful scarf, beautiful handiwork. Now you’ve got me curious about Sea Silk. I lurve Sea Silk. I use Addi bamboo needles and have had absolutely no sticking problems at all. Nor with winding the two Sea Silks, but I had one of a heck of a time with some Fleece Artist sock yarn–maybe it’s something to do with their skeining technique? I love the stitch pattern, it is absolutely fabulous! I think I may have to go out and get the book. You’ll need to start training for blocking that shawl! It’s really hard to block. How are you modifying the pattern to get a smaller size? Are you casting on half of the stitches? I would love to hear more about working with the VLT book. I’m on my second project and I’m loving it so far. Currently I’m working on the Myrtle leaf shawl, but know I’m going to do the melon shawl at somepoint. I’m forgetting to slip the first stitch sometimes too. I bought the swift/ball winder combo from WEBS and have been pretty happy with it. It’s all plastic but the price is good. I just bought some Sea Silk, so am grateful for the review. I might have to get some KnitPicks Options to knit it with. I will be curious to see how it blocks. Lovely melon scarf! And the colour is just so melon-y too! Just gotta say that the KnitPicks circulars have the glide of the Addis, but sharper tips — they’ve been a godsend for me with sticky yarns and lace knitting. The Seasilk takes a severe wet blocking very nicely. However, it doesn’t wear especially well if the scarf is worn everyday. I gave one as a gift to someone who is literally wearing it to death. Looking good there. Love the color. Even tho’ the swift’s on sale, type in the code and it’ll still change it to 50% off. (saving $30 isn’t too bad). The code is DECA650. Lovely color and pattern. And thanks much for the tip on the swift! Ewww, Bryspun. Seriously? I can’t stand those needles. Thanks as always for your commentary and inspiration. I must admit if they put Susan Bates tips on addi cords I would be in (what I consider) sock knitters nirvana. I am knitting a “tilting blocks” shawl with Sea Silk on bamboo needles and have no sticking problems at all. Who knows what games the knitting goddesses are playing with us? Since you are considering buying a swift, let me share my experience. I bought a large wooden swift many years ago when I was spinning my own yarn. Just recently, I bought one of those little plastic and metal models because the wooden swift had so much resistance that I couldn’t simply wind off a skein of yarn. I had to wind a ball and then immediately re-do it so all the life wasn’t pulled out of the yarn. The plastic swift doesn’t have the large diameter of the wooden one, but I haven’t had a skein that wouldn’t fit it. I love that pattern from the book, I love the edging just as much as the melon pattern. Is it fun, or does it get boring fast like some patterns? oddly enough i wound two skeins of sea silk tonight and while the first skein went just fine the second stopped cooperating towards the end and things got really bad. i can’t imagine trying to find this stuff without a swift! yikes. As always, your knitting is BEAUTIFUL! And, I must admit that hearing that you too have problems winding up balls of yarn, makes me feel better. It once took me 4 hours to unknot Lorna’s Laces Shepard’s Sock, and I have no idea how I even got it into that crazy knotty mess to begin with! The seasilk blocks beautifully, so much so that I’ve acquired a few more skeins. It’s much better for lace knitting IMO than normal st.st. I hand wound my skein and still managed to get into a tangle, but it was fairly easy to untangle, just had to snip the gathering ball of fluff off the yarn. Seasilk wet blocks fabulously. I have some ratehr bad pics of a Charlotte’s Web shawl that was aggressively blocked last spring, if you like, I can forward them to you. How you can you not have a swift??? My Sea Silk shawl took an aggressive wet block like a champ. I used Inox needles to knit mine, I think. Bamboo would not have been fun. What an interesting pattern – I like the yo/slipped stitch effect at the bottom of each…melon? Now I have to get the book. Lovely lace! I too, love the Bryspun tips, but only have 2 different sizes in straights and a large set of circulars, so I don’t get to use them that often. I have my Knitpicks Options, and assorted Addi’s, as well as many Clover Bamboo’s, straight and circulars, but lately I’ve been feeling that I need more tools. Different yarns and different projects need different needles. I love the way you test and discuss the pros and cons of needles. But I haven’t been able to explain to my husband how I need more needles. If he had any idea how much money I have invested in needles already, he’d freak out! Looks beautiful! I love the description of the yarn! I will put it on my “must try” list!!! Lovely! I must make my scarf soon! It’s so beautiful! I love that melon pattern! Thanks for the knitting info on the sea silk. I have a skein, but the only things I’ve done with it are wind it and smell it. I tried to use Bryspun needles — they were so cheap, it was hard to pass up buying a set. I found them impossible to negotiate, however. The yarn simply does not slide over that strange ridge at the bottom of the tip. I wonder how knitters manage to use these needles much less prefer them! I suppose if your yarn was always held below the rim it might work, but you still have to slip the yarn onto the next needle OVER that rim. I just think it’s the worst designed needle I’ve ever tried. I ended up giving the pair away. I had the same problem winding sea silk with my swift and winder. It nearly gave me a breakdown because I was winding it for a friend. I’ve just ordered three skeins on sale for myself and am scared to death to wind it. I’ve seen signs at yarn shops refusing to wind silk.